This restaurant uses organic vegetables from nearby farms has the theme of gardening and cultivating natural foods. 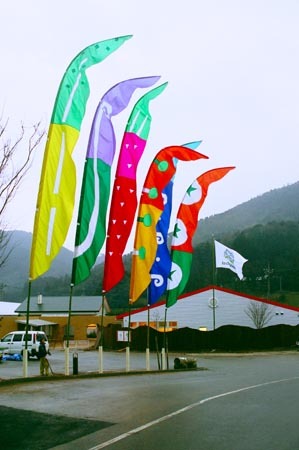 The flags attract attention of drivers passing by, letting them know the restaurant is open. This unique shape was made by bamboo's flexibility. When the wind blows, waves of flapping fabric move vertically on the flags. Herbs' shapes are part of the design and when the flags wave it appears as if it is a living creature. I am glad that people feel strong energy to live with their roots in the ground when they look these flags.